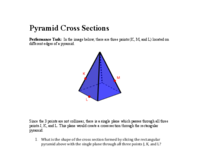 In the GeoGebra file below, use the tools to investigate the cross sections formed by slicing a plane through the three points located on the edges of the pyramid. 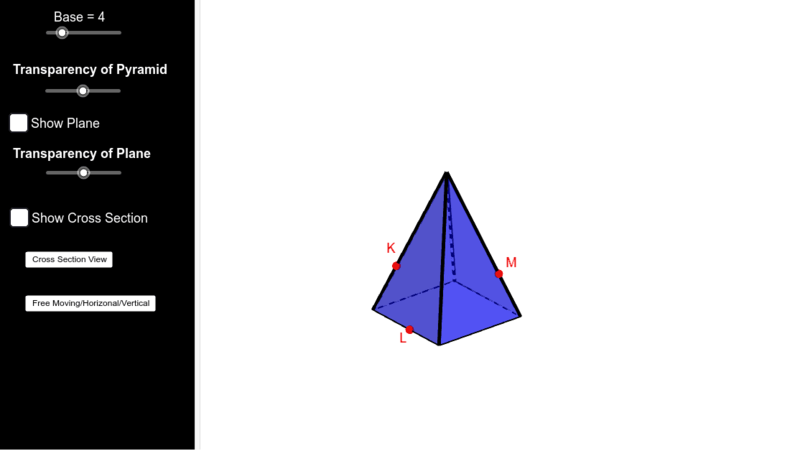 Attempt to answer the questions below before playing with the file here.Then move the points K, M, and L around on the edges of the pyramid, also use the slider to change the base of the pyramid. 3. What is the least number of sides a rectangular pyramid cross section shape can have? 4. What is the greatest number of sides a rectangular pyramid cross section shape can have? 6. Describe how changing the base of the pyramid would affect your answers to questions 3, 4, and 5.